In a recent TWOG where I described four basic forms of organizations (machine, entrepreneurial, professional, and project), I characterized our general understanding of organizations as primitive. We need much greater appreciation of the institutions that are so prominent in our lives, from our birth in hospitals through those where we learn, work, and play. I have written frequently in these TWOGs about the three main sectors of society and the need for balance across them. 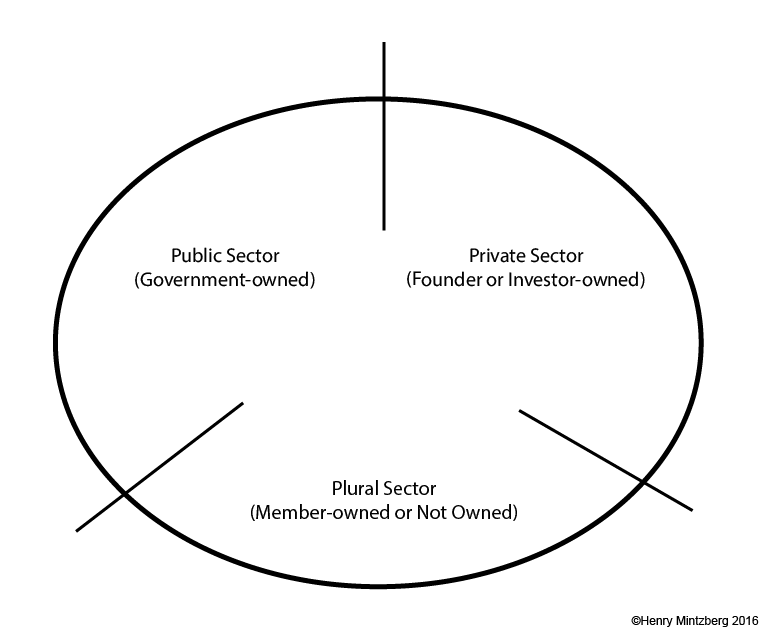 Here I plot various types of organizations around a circle according to whether they function in the public sector (owned by government, for example agencies and ministries), the private sector (owned by founders or investors, as in widely-held corporations), or the plural sector (owned by members, as in cooperatives, or by no-one, as in NGOs). For those of you using a wide screen, all of this can be seen on the one big circle above. 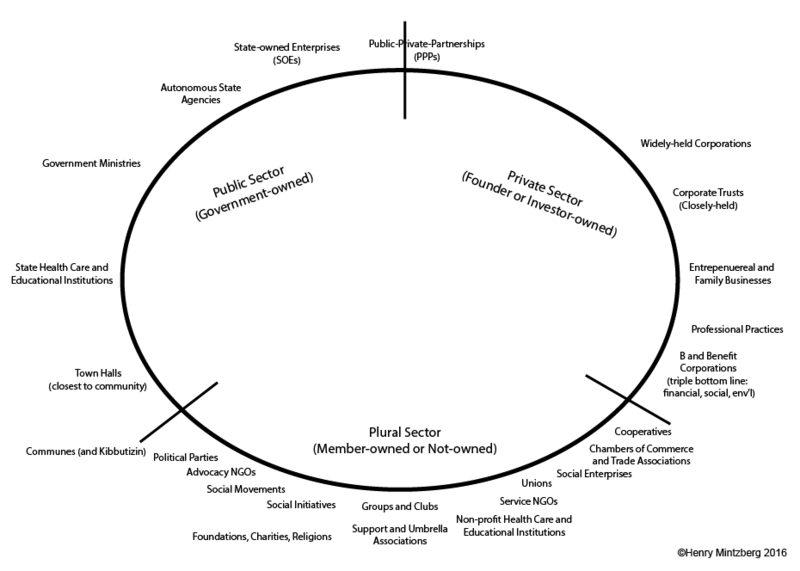 If you are using a smaller screen, this big circle is broken down at the end into the three segments of public private, and plural for easier reading. I make no claim that this circle includes all types of organizations. (I built it from all the notes I have been making for years about these different organizations.) Nor is the placement of these organizations tilting toward one sector or another indisputable, just suggestive. (There are, for example, family businesses that are rather mercenary, not community-oriented.) This framework may be rudimentary, but our understanding of organizations is far more rudimentary. We can use all the help we can get! A couple of comments about all this: First, you see many more types under plural than under public or private. Of course that is why I call the sector plural! There are all kinds of businesses, but not so many distinct types. And while the range of activities in government is vast, the marching orders that come from being public limit their activities somewhat. 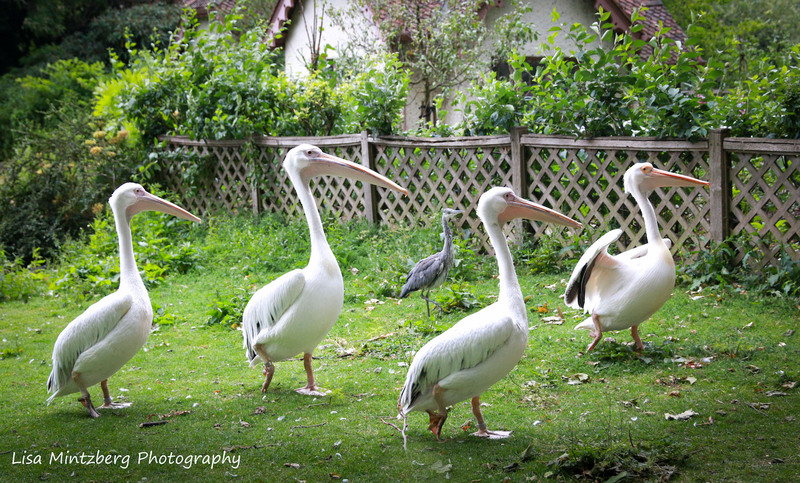 The plural sector is the most varied of the three. The point, which I emphasize in my book Rebalancing Society, is that the three sectors are, and must remain, distinct as well as strong if our societies are to regain balance. Organizations belong in their place. B Corps may care about more than profit, but they are still businesses. And NGOs should no more be run like businesses than businesses should be run like NGOs. 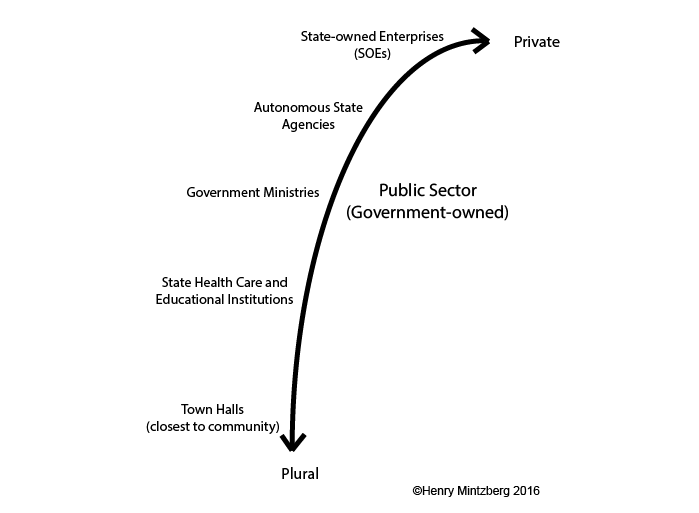 Likewise, the “New Public Management”, so reflective of old corporate values, has been doing a number on many governments for years (as I hope to discuss in next week’s TWOG). © Henry Mintzberg 2016 Follow this TWOG on Twitter @mintzberg141, or receive the blogs directly in your inbox by subscribing here. To help disseminate these blogs, we now also have a Facebook page and a LinkedIn. 1 Of course, a company like Volkswagen, owned by both governments and private shareholders, is technically a hybrid too, although the tendency here is to run such enterprises like regular businesses.